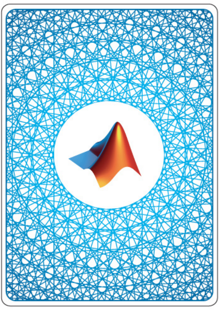 MathWorks is creating a deck of playing cards that will be offered as gifts at our trade show booths. 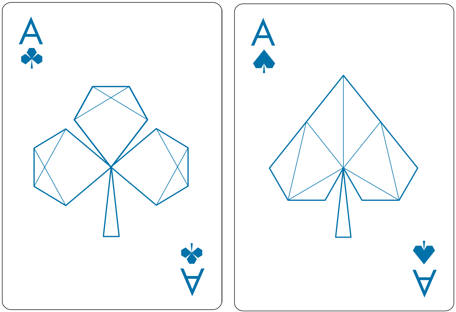 The design of the cards is based on Penrose Tilings and plots of the Finite Fourier Transform Matrix. 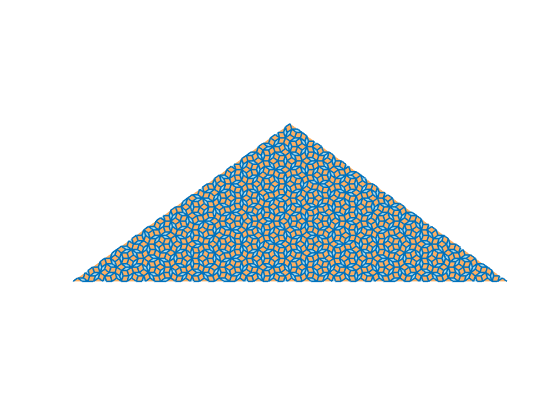 This is an example of a Penrose tiling. Penrose tilings are aperiodic tilings of the plane named after Oxford emeritus physicist Roger Penrose, who studied them in the 1970s. MathWorks' Steve Eddins has written a paper about his MATLAB program for generating Penrose tilings. I will include the paper in this blog post. 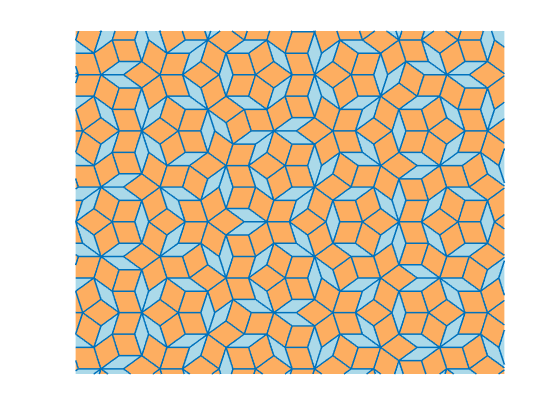 Steve has also submitted his paper and code to the MATLAB Central File Exchange, Penrose Rhombus Tiling. Look carefully at the example tiling. It's made entirely from two rhombuses, one colored gold and one colored blue. Each rhombus, in turn, is made from two isosceles triangles. 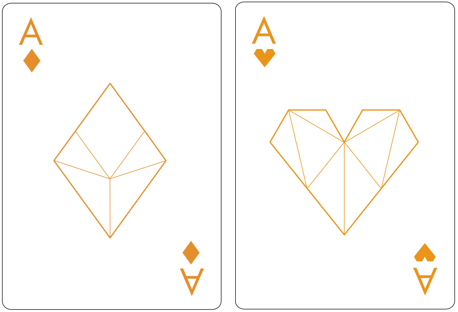 These shapes inspired MathWorks designer Gabby Lydon to reimagine the traditional symbols for the four suits in a deck of cards. Here are the diamonds and hearts. Here are the clubs and spades. 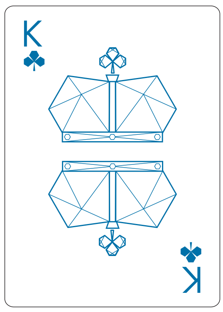 The theme of triangles and rhombuses is continued in the face cards. 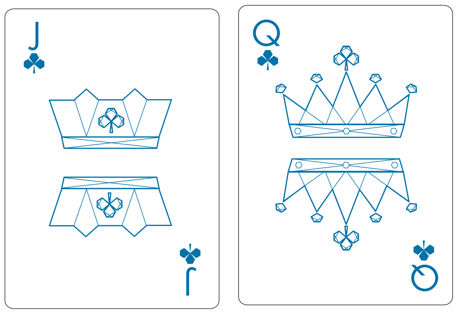 The backs of the cards feature two mathematical objects that I have described in this blog. I wrote a five-part series about our logo five years ago, beginning with part one. 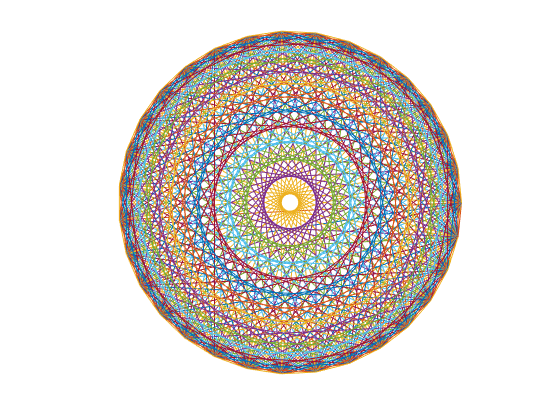 And, I wrote about the graphic produced by the Finite Fourier Transform matrix. Start with a prime integer. Take a Fourier transform of the columns of the identity matrix. Plot it. Because 31 is prime, this is the complete graph on 31 points. Every point on the circumference is connected to every other point. Now graphic design software takes over and makes room for the logo. All this has reminded me of two FFT-related apps from Numerical Computing with MATLAB, fftgui and fftmatrix. I've added them to Cleve's Laboratory with Version 3.9. 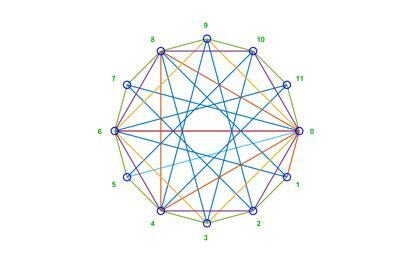 This is the image from fftmatrix for n = 12. Because 12 is not prime, this is not a completely connected graph. You can vary both the matrix order and the columns to be transformed. 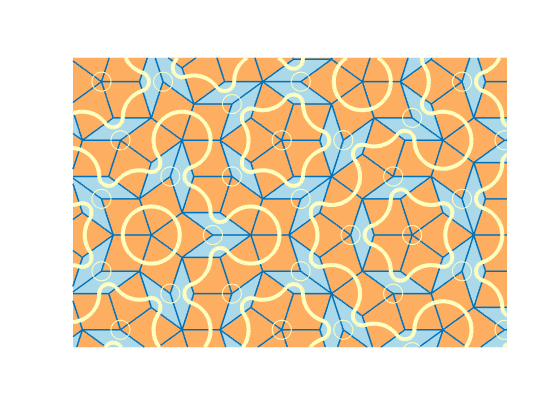 Now, here is Steve's paper about Penrose tiling. 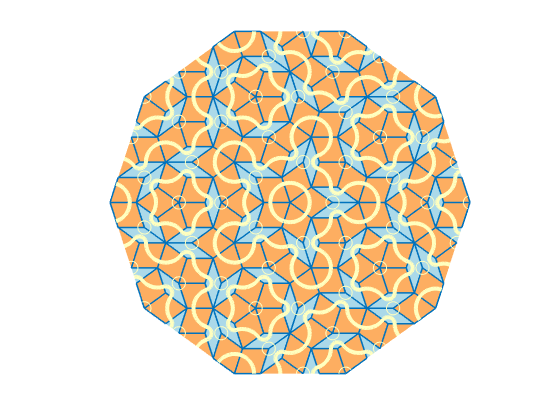 This is an example of a Penrose tiling. Penrose tilings are aperiodic tilings that named after Roger Penrose, who studied them in the 1970s. This particular form, made from two rhombuses, is called a P3 tiling. Construction of a Penrose P3 tiling is based on 4 types of isosceles triangles. 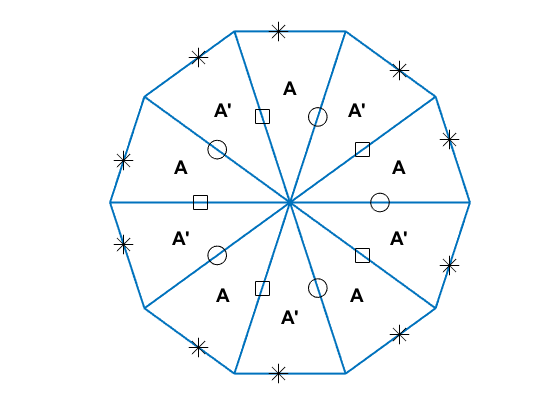 The types are labeled A, A', B, and B'. The A and A' triangles have an apex angle of 36 degrees, and the B and B' triangles have an apex angle of 72 degrees. Before proceeding further, let's pause to look at what the functions aTriangle, apTriangle, bTriangle, and bpTriangle do. 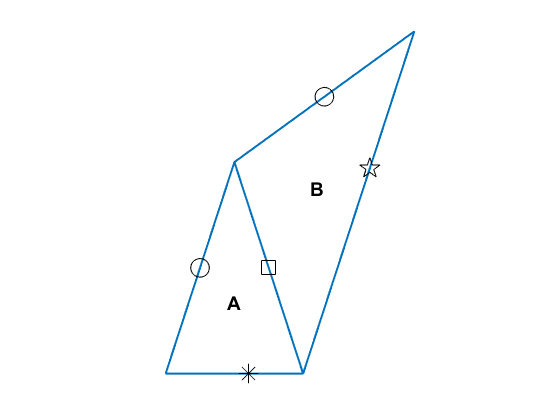 The function aTriangle takes three arguments: aTriangle(apex,left,right). Each of the three arguments is a point in the complex plane that represents one triangle vertex. You specify any two points, passing in the third point as , and aTriangle computes the missing vertex for you. Here's an example showing how to compute a type A triangle whose base is on the real axis, extending from -1 to 1. 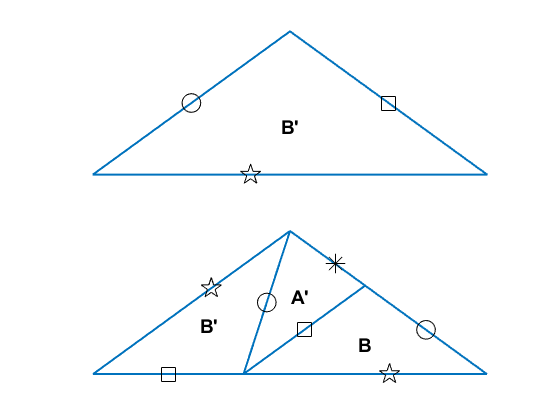 The result is returned as a table, which is convenient because we'll be creating large collections of these triangles, and it is helpful to be able to refer to the different vertices of the triangles using the notation t.Apex, t.Left, and t.Right. 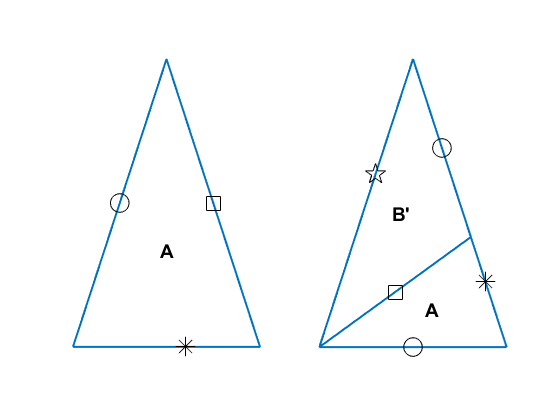 The markers on the sides of the triangles help us to distinguish between A and A' triangles, as well as between B and B' triangles. 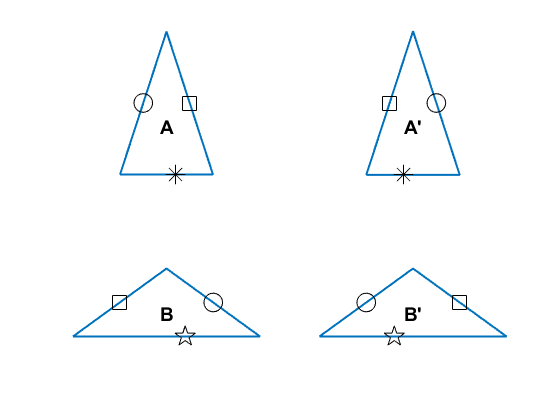 For example, an A triangle has the circle marker on the left side (assuming the apex is oriented at the top), whereas the A' triangle has the circle marker on the right side. 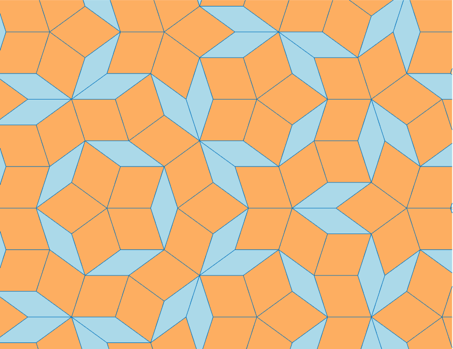 The side labels also help us confirm whether we have a correct arrangement of triangles in our Penrose tiling. 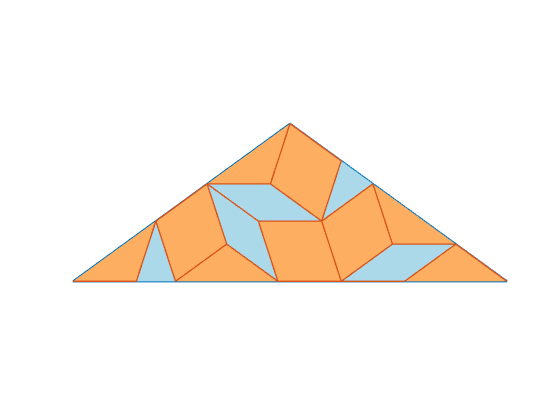 Triangles are only allowed to share an edge in the Penrose P3 tiling if the side markers align together and are the same. For example, in the two triangles shown above, the square marker on the right edge of the triangle lines up with the square marker on the left edge of the B triangle. If we had used a B' triangle instead, the markers would not have been identical. 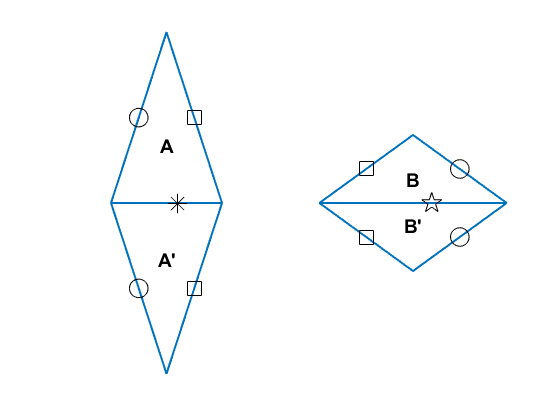 In the Penrose P3 tiling, one rhombus is made from an A and an A' triangle, and the other is made from a B and a B' triangle. 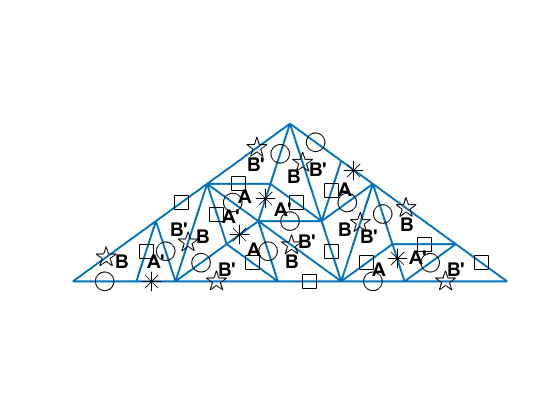 Construction of the P3 tiling proceeds by starting with one triangle and then successively decomposing it. 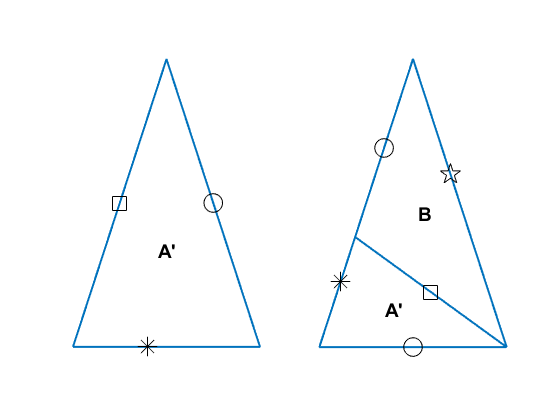 Each of the four types of triangles has a different rule for decomposition. 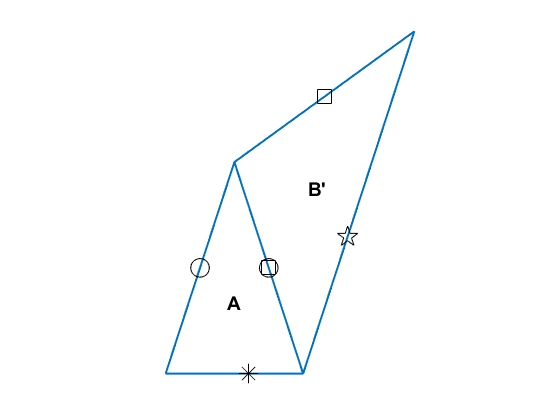 An A triangle decomposes into an A triangle and a B' triangle. You can look at the very short implementation of decomposeATriangle to see how this is done. The smaller A triangle is determined by placing its apex at the left vertex of the input triangle and placing its left vertex at the right vertex of the input triangle. The smaller B' triangle is determined by placing its left vertex at the apex of the input triangle and placing its right vertex at the left vertex of the input triangle. 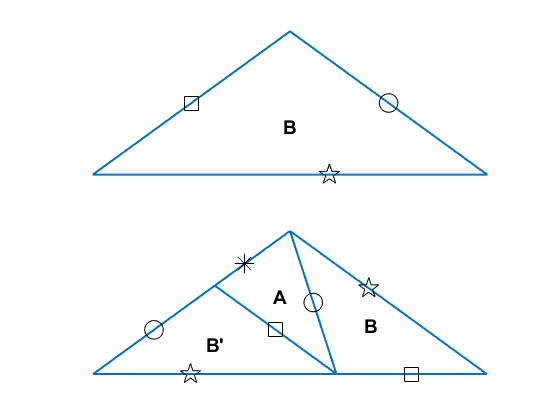 There are similar rules for decomposing the other three types of triangles. Let's start with a B triangle and decompose it three times successively. Now the labels are getting in the way. That's better, but it's hard to visualize the rhombuses because the triangle bases are being drawn. Let's switch to a different visualization function that draws the rhombuses with colored shading and without the triangle bases. Let's do five more levels of decomposition. Now we have lots of triangles. Let's take a look. 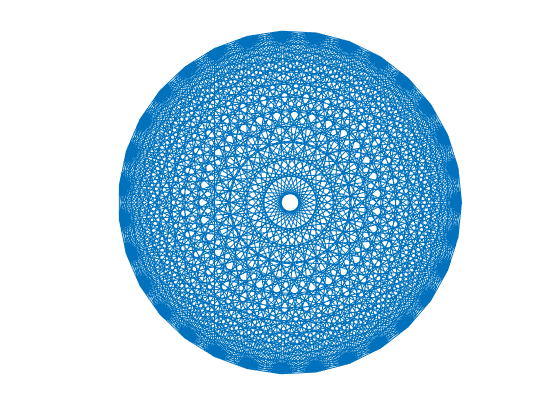 For fun, you can add to the visualization by inserting arcs or other shapes in the triangles. You just need to make everything match up across the different types of triangles. The showDecoratedTiles function shows one possible variation. 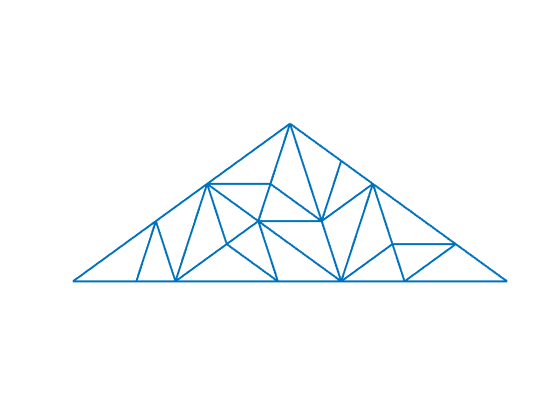 Another interesting thing to try is to start from a pattern of multiple triangles instead of just one. You just to arrange the initial triangles so that they satisfy the side matching rules. Let's use a circular pattern of alternating A and A' triangles sharing a common apex. I tried the fourier transform plot code myself with different numbers, and i thought it was super cool. Made my day. thanks.